Last night saw the conclusion to Hearthstone's Curse Trials, a tournament which sought to replicate the impact of the game's new Standard format by banning players from using anything from the Goblins vs Gnomes or Curse of Naxxramas sets. As you can see, that meant a lot of big cards were ineligible. 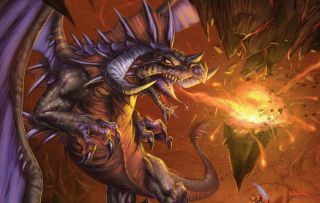 However, without the new expansion or the nerfs to the Classic cards Blizzard is planning to make this spring, the event was dominated by Aggro Shaman and Midrange Druid decks to the point of becoming a little dull. At least until the final. The whole series between 2015's Europe Champion Thijs "ThijsNL" Molendijk and Janne "Savjz" Mikkonen is worth watching, but the video embedded above starts with the match tied at 2-2. Both players are using Dragon-focused decks, with Thijs playing Warrior and Savjz the Priest. I don't want to spoil what happens but suffice to say it involves multiple Ysera, Onyxia and Varian Wrynn plays. You can try unpicking the last few turns looking for misplays, or you can just sit back and let the madness wash over you. GG to the winner, who took home $12,500. Hopefully this finally answers the question: Can you have too many dragons? And the answer is: No. None more dragons.